*This article has been updated to reflect what Meghan actually wore as her second wedding dress. Our ADRIENNE gown is made with a beautiful beaded lace that is easy to wear and can bustle in the back. Meghan might surprise in a full ball gown, then could opt for something a bit more simple, but with all the detail like this gorgeous gown for a second wedding dress! With a high front neckline and illusion V, ANGELINE is anything but ordinary. This modern slim gown has Meghan Markle written all over her. Plus, the crepe is lightweight so it's easy to move in, ahem dance in, and won't weigh you down. The GISELLE gown has a removable train that can we worn for the ceremony -- a.k.a. a dramatic effect! Then can be removed to get around more easily when visiting with guests at the reception. Meghan would greatly benefit from a removable train like this one! You have to be able to dance at your wedding reception! PENELOPE has you covered with her twirl-ability -- this tulle skirt is so lightweight you get the fullness without the heaviness and you'll want to dance all night! Plus, it's got straps to hold everything in place! 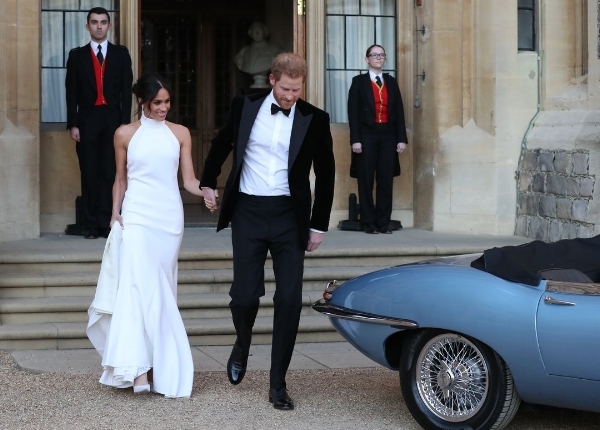 Meghan could rock a blue ball gown -- just saying.